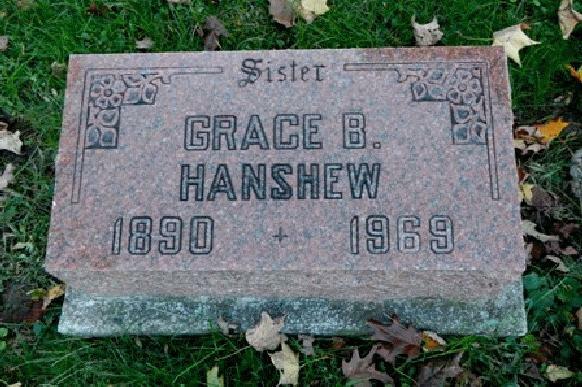 Grace B. Hanshew1,2,3,4,5,6 [Grace B. Henshaw6]. Hanshew, Grace, daughter, age 19, born in Indiana; parents born in Indiana; single; occupation: laundress, laundry. Hanshew, Grace, sister, age 19, born in Indiana; parents born in Indiana; single; occupation: laundress, laundry. 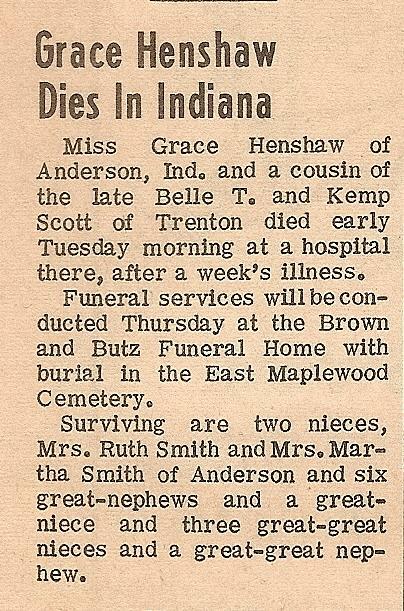 Hanshew, Grace, daughter, age 29, born in Indiana; parents born in Indiana; single; occupation: none. Hanshew, Grace, daughter, age 39, born in Indiana; parents born in Indiana; single; occupation: press operator, auto parts. McCarty, Martha, granddaughter, age 16, born in Indiana; parents born in Indiana; single; attended school. Hanshew, Grace, head-of-household, age 49, born in Indiana; completed 2 years of high school; on Apr 1 1935 was living in the same place/area; single; owned home ($4000 value); occupation: assembly, automobile industry; worked 43 weeks in 1939; $1164 wages in 1939. 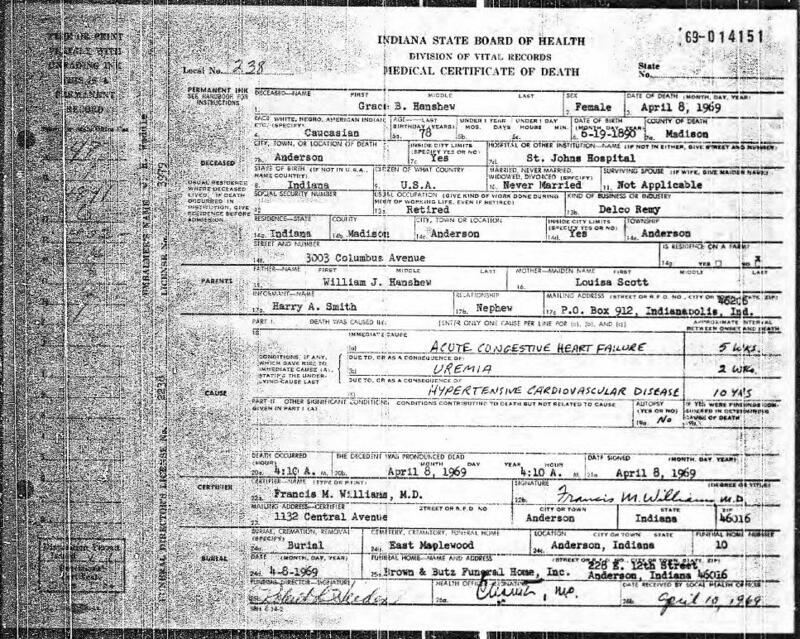 Smith, Martha, niece, age 26, born in Indiana; completed 4 years of high school; on Apr 1 1935 was living in the same place/area; married; occupation: assembly, automobile industry; worked 42 weeks in 1939; $1089 wages in 1939. Smith, Herbert, lodger, age 29, born in Indiana; completed 3 years of college; on Apr 1 1935 was living in the same place/area; married; occupation: coil dept. foreman, automobile industry; worked 48 weeks in 1939; $1856 wages in 1939, plus other income. 1900 census, 1st Ward, Anderson, Madison County, Indiana; roll T623-385, ED 80, page 2A, line #30, dwelling #20, family #22. 1910 census, 2nd Ward, Anderson, Madison County, Indiana; roll T624-365, ED 93, page 124A, line #35, dwelling #138, family #150. 1920 census, 3rd Ward, Anderson, Madison County, Indiana; roll T625-448, ED 110, page 14B, line #92, dwelling #411, family #389. 1930 census, 3rd Ward, Anderson, Madison County, Indiana; roll T626-605, ED 23, page 13B, line #96, dwelling #316, family #354. 1910 census, 6th Ward, Kokomo, Howard County, Indiana; roll T624-356, ED 134, page 9A, line #8, dwelling #199, family #214. 1940 census, 1st Ward, Anderson, Madison County, Indiana; roll T627-1072, ED 48-12, page 63B, line #73, household #364.